Is there another longtime Washington insider more pro-big business and with more ties to the financial industry and energy corporations than U.S. Senator Jim Inhofe? It is not a stretch to claim that taken together-Inhofe’s staunch right-wing view that big businesses should dictate government policy and the $1.3 million he has reportedly received from Wall Street-these two aspects of Inhofe’s political career clearly show and symbolize how the current financial crisis was created. Big businesses give money to our politicians who then allow them to essentially non-regulate themselves. Inhofe is not the only Washington politician to lose touch with the vast majority of people he represents, but he may well be the most obvious. As the stock market declines, the financial crisis especially hurts people near or at retirement age, though the entire fallout will surely be much worse as more jobs and homes are lost. The crisis has most Inhofe critics, most notably his election opponent state Sen. Andrew Rice, 35, claiming the Senator has his priorities wrong. What about the middle-class people in Oklahoma? Who will speak up for their retirement? At 73, Inhofe could retire right now with a decent government pension and great health insurance. So why would he care about your retirement, right? With his narrow concerns refuting the science of global warming, your retirement is not even in Inhofe’s frame of reference. This is not the first time Inhofe has faced such questions about priorities. In 2002, Inhofe was criticized for supporting legislation that weakened the accountability of auditors after accepting $19,500 in campaign contributions from the accounting industry, according to a news report. In his campaign against Inhofe, former Oklahoma Gov. David Walters argued that Inhofe’s action’s had given accounting firms a “form of immunity,” which led to the Enron and WorldCom debacles, the report stated. Walters said Inhofe signed on as sponsor of the securities act on Feb. 1, 1995, and received $19,500 in contributions from the accounting industry before the bill became law when Inhofe joined in the override of a presidential veto. Some of the donations were from Arthur Anderson, the accounting firm associated with the WorldCom and Enron scandals. The timing of the contributions, Walters said, was “very suspicious in absence of a strong explanation”from Inhofe. Walters said the 1995 legislation weakened the hand of the Securities Exchange Commission and gave accounting firms a degree of immunity. He said Inhofe has yet to back tough legislation to remove problems that led to the WorldCom scandal. He said Inhofe has a moral obligation to explain his actions to the 3,000 WorldCom employees in Tulsa and the thousands of Oklahoma teachers whose retirement fund lost $17 million because of the company’s collapse. Inhofe, after weakening accounting rules, later supported President George Bush’s push to “reform” Social Security by allowing for personal accounts, which would be conceivably tied to the stock market (Jim Meyers, “State delegation assesses the address,” Tulsa World, February 3, 2005). Can you imagine if Social Security accounts were directly tied to the recent fallout of Wall Street greed? The nation’s current financial crisis can be directly attributed to the over-reaching philosophy that the free market can do no wrong, a philosophy embraced by President George Bush and GOP cronies like Inhofe. Rice has questioned Inhofe’s inaction and lack of concern for ordinary Oklahomans as the financial crisis deepens to proportions resembling the Great Depression. In his recent debate against Inhofe, Rice said, “An era allowed this to happen. George Bush came into office eight years ago with a Republican majority and … an agenda of radical deregulation.” Inhofe has consistently supported Bush’s policies. 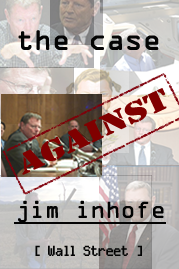 Watch Andrew Rice challenge Jim Inhofe for doing nothing as the country slipped into a major financial crisis. Click the link to view all the clips. State Sen. Andrew Rice trounced U.S. Sen. Jim Inhofe in Tuesday’s debate in Tulsa. Rice, an Oklahoma City Democrat, is trying to unseat the Republican Inhofe in the November election. The debate was televised by KJRH-2, which also streamed it live on the Internet. There was a small studio audience. During the debate, Rice, 35, repeatedly challenged Inhofe for supporting unwise and sometimes horrendous government policies during the last eight years under President George Bush, one of the most unpopular presidents in modern American history. The state Senator pounded Inhofe on supporting investment banking deregulation sponsored by “special interests” during the Bush years, leading to the recent $700 billion taxpayer bailout of Wall Street. Inhofe allowed these special interests to essentially non-regulate the financial markets, he charged, and now Main Street is suffering. Rice argued Inhofe has allowed terrorist cells in other countries to flourish-a real threat to American security-because of his blind support for the Iraq war. Rice also argued Inhofe has done nothing to help solve the country’s health care crisis. Meanwhile, Inhofe, 73, offered no new initiatives or programs he plans to undertake in the next Senate, which will almost certainly contain a larger Democratic majority. He offered no real defense of his previous votes, which have favored Bush policies more than 90 percent of the time. He stood by his bizarre statements about global warming that have made him infamous around the world. To his credit, he often agreed with Rice on his positions. In the debate, Rice depicted Inhofe as a Washington insider that has allowed special interests to dictate policy and legislation. “The middle class has become invisible to Washington,” Rice said, arguing the Inhofe was using the debate to take “political potshots” instead of trying to find solutions to the country’s growing economic crisis. Inhofe downplayed the financial crisis, arguing that Oklahoma has a better economic climate than much of the country as Rice talked about his experiences on the campaign trail meeting people who are suffering financially. Rice also offered a bipartisan approach to solving the health care crisis by bringing business and government leaders together to reduce health care costs. Inhofe talked about medical malpractice lawsuits. U.S. Senators Jim Inhofe and Tom Coburn continue to vote against the interests of Oklahomans when it comes to privacy rights and medical issues. This week Republicans Inhofe and Coburn voted to extend the so-called “no warrant wiretapping bill” that grants retroactive immunity to telecommunication companies for participating in President George Bush’s illegal wiretapping program. They also voted against a bill that will prevent drastic cuts in Medicare payments to physicians. The wiretapping bill passed despite opposition from a broad range of organizations and individuals concerned with civil and privacy rights. The bill allows the government to continue to spy on its citizens without adequate judicial oversight. Telecommunication companies who previously helped the government spy on its citizens will face no penalty under the bill’s provisions. The Medicare bill passed by a veto-proof margin despite the opposition from Inhofe and Coburn. Law-abiding Oklahomans concerned with protecting their privacy from government intrusion should be appalled the state’s two senators voted in favor of the wiretapping bill. Will the government read your email, listen to your telephone conversations? How will the government use your personal information against you? Why should big corporations be immune from the law? Oklahomans who rely on Medicare or know people who use Medicare should be extremely concerned about the Inhofe and Coburn votes. If the cuts would have remained in effect, many doctors would have stopped accepting Medicare patients, according to media reports. This would have impacted the lives of thousands of elderly Oklahomans. The 73-year-old Inhofe is running for reelection this year. His main opponent, Rice, 35, an Oklahoma City Democrat, was recently cited by Blue America as a “Real American Patriot” on the popular blog Down With Tyranny for opposing the wiretapping measure. Rice has called on Inhofe to return the $342,166 he has received in campaign donations from private insurance companies because of his vote on the Medicare bill. Inhofe is siding with these companies over seniors, according to Rice. Rice also pointed out that Inhofe has voted against Medicare 17 times since 1995.